What's In A Name? 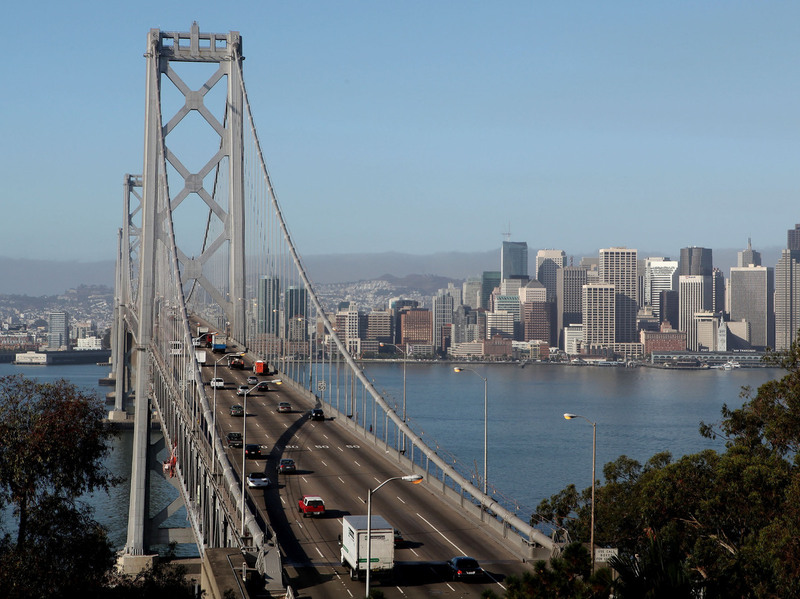 Potentially, Major Controversy : The Two-Way The naming of the western span of the San Francisco-Oakland Bay Bridge has sparked a political debate about the legacy of a long-serving former mayor. The western span of the San Francisco Bay Bridge in a photo taken earlier this week. The new eastern span of the Bay Bridge, connecting Oakland and San Francisco, opened earlier this month. But it's the western span that's now causing controversy. The California Senate is expected to vote this week to approve a resolution naming the span after Willie Brown, a former San Francisco mayor and state Assembly speaker. The idea sailed through the state Legislature last month, winning approval on a 68-0 vote. But Gov. Jerry Brown (no relation) came out against the idea on Monday. A number of Bay Area politicians are also opposed, including several current and former San Francisco supervisors. Brown was a successful politician but not universally beloved. It has passed into California political folklore that voters approved term limits for state legislators mainly in hopes of ending his long reign in Sacramento. Aaron Peskin, a former president of the San Francisco Board of Supervisors, doesn't mince words in expressing his opposition. "We are political opponents and I find him to be a nepotistic, immoral figure in California politics," he says. "I don't believe any structure should bear his name." There's always a risk in naming important buildings and bridges after individuals that you might anger someone. There was a push in Amarillo, Texas, last year to name a bridge after the late Manny Perez, a former Potter County supervisor who had helped secure its funding. The county commission approved the idea in December, but city officials, who actually had the authority, have never taken it up. "The city currently has no plans to name that bridge," says Sonja Gross, community relations coordinator for Amarillo. "Even though it got a lot of coverage, there was only a small group of people pushing that." Disputes over naming or renaming local landmarks take place all the time, from Stroudsburg, Pa., to Istanbul. Someone who is a hero to one group can stir angry feelings in another. That's why so many bridges are left unnamed. But sometimes there's a bridge that is so new or so prominent that politicians simply can't resist. That doesn't mean they'll always agree on whom to honor. With a new bridge over the Mississippi River nearing completion, folks in Missouri thought it would be a swell idea to name it after St. Louis Cardinals great Stan Musial, who died in January. People on the Illinois side, however, wanted to name the bridge to honor veterans. Members of Congress from both states worked out a deal. In July, President Obama signed legislation naming it the Stan Musial Veterans Memorial Bridge. Peskin, the former San Francisco supervisor, recalls the controversy that surrounded the city's effort to honor another baseball legend, Joe DiMaggio. After he died in 1999, the city renovated and renamed a playground in the North Beach neighborhood where DiMaggio had played as a kid. Morris Engelberg, the lawyer for DiMaggio's estate, said that wasn't sufficient tribute. In fact, he called it "insulting." He insisted on something grander, such as the airport or — you guessed it — the Bay Bridge. Engelberg sued to block the city in federal court in Miami, where the estate was located. The judge wasn't thrilled, saying she had no jurisdiction and it was a long way for San Francisco officials to come to have to defend naming a neighborhood park. "Unlike the game of baseball, personal jurisdiction in federal court is not a fielder's choice," she wrote. "We sent a deputy city attorney out there," Peskin recalls. "After we won, he said, 'It's time for Mr. Engelberg to wake up and smell the Mr. Coffee.' "